NARPM Southwest FL – What is a Real Service Dog? What is the difference between an Emotional Support Animal and a Service Animal? How to handle the difference with prospective and existing tenants and owners. Michael is originally from the Dayton Ohio area and was in the music business after high school, both as a musician and as a broadcaster on the radio. He was born with a hereditary eye condition called RP and has been legally blind since birth, but due to aging, lost much of his usable vision. Michael came to Florida in 1986 while attending Wright state University in Dayton after a job offer at a radio station in Charlotte Harbor. He was on the air in Southwest Florida for 10 years including hosting the annual Sanibel Jazz on the Green festivals in the early 90’s. For the last 11 years he has been working with the Centers for Independent Living, and for the last 6 years for the ADA advocate and Independent Living Specialist for the CIL Gulf Coast in Fort Myers, which serves several SWF counties. 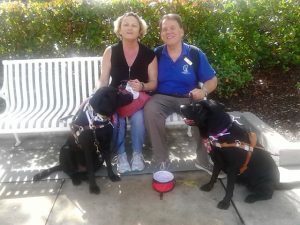 Approximately five years ago, Michael was introduced to, and began working with a 75-pound Black Labrador Retriever guide named Addy, who gets him where he needs to go and is an excellent ice-breaker and a furry ambassador for the Center and also for Southeastern Guide dogs in Bradenton where she “studied” for 20 months. Since July, 2015 when governor Scott signed a new law trying to pass a pet or comfort animal as a working ADA service dog a criminal offense in the state of Florida, the number of calls I receive on this issue are five fold.